John Mackie was also banned from keeping animals for life after being sentenced at Edinburgh Sheriff Court. A man who forced two nine-inch knives up the nose of his pet dog has been jailed for 12 months. John Mackie was also banned from keeping animals for life after being found guilty of the offence at Edinburgh Sheriff Court. 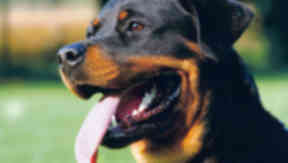 The 44-year-old, from Clovenstone Park, Edinburgh was sentenced to a year imprisonment for his attack on eight-year-old Rottweiler named Sunny. Mackie was found guilty of causing unnecessary suffering to the dog by beating, stabbing and killing him on June 23 last year. Chief superintendent Mike Flynn said: "In 28 years of working with the Scottish SPCA, this is one of the most heinous acts of cruelty we have dealt with. "We received an anonymous call to our animal helpline that Sunny's body had been dumped in bushes near Mackie's address. "When we questioned Mackie, he stated he had been told Sunny was hit by a bus. "Post-mortem findings established that Sunny appeared to have suffered a severe beating, with extensive haemorrhaging over his body and skull. "Horrifyingly, two dining knives were found in Sunny's upper airway having been forced up his nose. "These knives were approximately nine inches long and were not visible from the outside as they were lodged so far up. "A 44cm-long branch was also found in Sunny's abdominal cavity." The Scottish SPCA is the only animal charity in the UK able to report animal cruelty cases to the Crown. Last year 63 people were banned from keeping animals following other investigations. Chief superintendent Flynn added: "We welcome the 12 month custodial sentence given to Mackie as this sends out a strong message that abusing an animal is a criminal offence and the courts will take action. "In addition, we are pleased Mackie has been banned from owning, keeping or taking possession or care of any animal for life. "In our view, banning people guilty of mistreating and abusing animals can only help prevent more suffering. "Bans also send an important message that owning an animal is a privilege rather than a right."